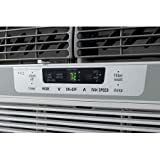 Frigidaire's FFRE1533Q1 15,100 BTU 115V Window-Mounted Median Air Conditioner is perfect for cooling a room up to 850 square feet. It quickly cools the room on hot days and quiet operation keeps you cool without keeping you awake. Low power start-up and operation conserves energy and saves you money. Ready-Select electronic controls allow you to set the comfort level to your preference, while a convenient temperature-readout displays the set temperature. Effortless temperature sensing remote control allows you to see, set and maintain room temperature from across the room. The multi-speed fan features three different speeds for more cooling flexibility and the 8-way comfort control design allows you to easily control the direction of the cool air, wherever the unit is mounted. Plus, the clean air ionizer removes pollen and impurities from the air providing relief for allergy sufferers. 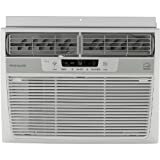 Frigidaire 18,000 BTU 230V window-mounted Median air conditioner is perfect for cooling a room up to 1,020 square feet. It quickly cools the room on hot days and quiet operation keeps you cool without keeping you awake. Low power start-up and operation conserves energy and saves you money. Ready-select electronic controls allow you to set the comfort level to your preference, while a convenient temperature-readout displays the set temperature. Effortless temperature sensing remote control allows you to see, set and maintain room temperature from across the room. The multi-speed fan features three different speeds for cooling flexibility and the 8-way comfort control design allows you to easily control the direction of the cool air. Plus, the clean air ionizer removes pollen and impurities from the air providing relief for allergy sufferers. This unit requires a special 230V electrical Outlet and will not operate with a standard 115V household electrical Outlet. 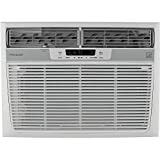 Frigidaire 25,000 BTU 230V window-mounted heavy-duty air conditioner is perfect for cooling a room up to 1,600 square feet. It quickly cools the room on hot days and quiet operation keeps you cool without keeping you awake. Low power start-up and operation conserves energy and saves you money. Ready-select electronic controls allow you to set the comfort level to your preference, while a convenient temperature-readout displays the set temperature. Effortless temperature sensing remote control allows you to see, set and maintain room temperature from across the room. The multi-speed fan features three different speeds for cooling flexibility and the 8-way comfort control design allows you to easily control the direction of the cool air. Plus, the clean air ionizer removes pollen and impurities from the air providing relief for allergy sufferers. This unit requires a special 230V electrical Outlet and will not operate with a standard 115V household electrical Outlet. 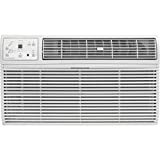 Frigidaire's FFTA1422R2 14,000 BTU 230V Through-the-Wall Air Conditioner is perfect for cooling a room up to 700 square feet. This unit is designed for through-the-wall installation and is not designed for standard window installation. It will fit most existing wall sleeves and includes a standard universal interior trim kit. New wall sleeves are sold separately. This unit also requires a special 230V electrical outlet and will not operate with a standard 115V household electrical outlet. The ready-select electronic controls allow you to set the comfort level to your preference, while a convenient temperature-readout displays the set temperature. Effortless temperature sensing remote control allows you to see, set and maintain room temperature from across the room. The multi-speed fan features three different speeds for more cooling flexibility and the 4-way comfort control design allows you to easily control the direction of the cool air, wherever the unit is mounted. 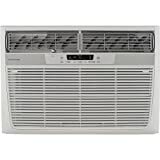 Frigidaire's FFRA2822R2 28,000 BTU 230V Window-Mounted Heavy-Duty Air Conditioner is perfect for cooling a room up to 1,900 square feet. It quickly cools the room on hot days and quiet operation keeps you cool without keeping you awake. Ready-Select electronic controls allow you to set the comfort level to your preference, while the convenient temperature readout displays the set temperature. Effortless temperature sensing remote control allows you to see, set and maintain room temperature from across the room. The multi-speed fan features three different speeds for more cooling flexibility and the 8-way comfort control design allows you to easily control the direction of the cool air, wherever the unit is mounted. Plus, the clean air ionizer removes pollen and impurities from the air providing relief for allergy sufferers. This unit requires a special 230V electrical outlet and will not operate with a standard 115V household electrical outlet. 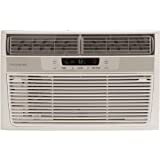 Frigidaire 12,000 BTU 115V window-mounted compact air conditioner is perfect for cooling a room up to 550 square feet. It quickly cools the room on hot days and quiet operation keeps you cool without keeping you awake. Low power start-up and operation conserves energy and saves you money. Ready-select electronic controls allow you to set the comfort level to your preference, while a convenient temperature-readout displays the set temperature. Effortless temperature sensing remote control allows you to see, set and maintain room temperature from across the room. The multi-speed fan features three different speeds for cooling flexibility and the 8-way comfort control design allows you to easily control the direction of the cool air, wherever the unit is mounted. Plus, the clean air ionizer removes pollen and impurities from the air providing relief for allergy sufferers.